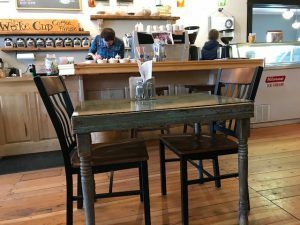 Fort Benton’s Wake Cup Coffee House & Restaurant has joined Central Montana’s Pie a la Road, a 19-location pie trail that weaves through 13 counties. 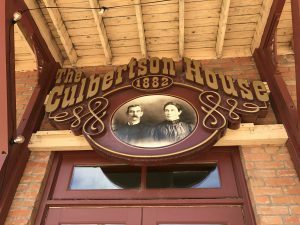 Located in the historic Culbertson House on Front Street in Fort Benton, the Wake Cup faces the river levee and the Missouri River. Breakfast, lunch and dinner are served along with specialty coffee drinks, teas, wine and beer. When you first walk in the door of the Wake Cup it doesn’t take long to be tempted to have a pastry, muffin or, in my case, a piece of pie. A display case full of yummy homemade baked goods is one of the first things you see when you enter the restaurant. We chatted with our waiter and he said they had mixed berry pie with a crumb topping and of course, the option of “a la mode” with vanilla ice cream. I was tempted to have a scoop topping my pie – it’s great for photos you know! However, I decided to just savor the mixed berry pie. My pie was an amazing combination of strawberries and blueberries. 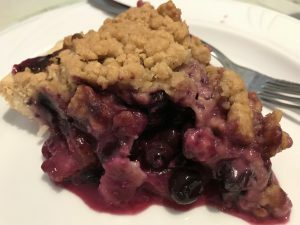 The juicy flavors of the berries came through in every bite and I love a crumb topping on pie. I’d call it a deep-dish pie and it was loaded with fruit. A huge thumbs up from me! I had a steaming cup of walnut green tea to go with my pie and it was divine. We visited with the owner and she said their baker trained at a culinary institute in New York City. They do have a wide selection of pastries – colorful macarons, decadent cakes, cookies and pies. It will take me several visits to work my way through all of those treats! The décor at the restaurant and bar is a combination of eclectic, antique and repurposed. We sat in a wooden booth with a repurposed door for a tabletop that was then topped with glass. The ceiling is covered in decorative tin, and hanging pendant light shades are covered with newsprint. The bar side is separate from the restaurant and has a beautiful back bar, dark wooden doors repurposed as tables, and wooden chairs. The building where the Wake Cup Coffeehouse & Restaurant is located was originally called the Culbertson House. It was built in 1864 and operated as a hotel and restaurant. In 1882 it was rebuilt with brick and that beautiful structure still stands today. The building is on the National Register of Historic Places. Open Monday through Saturday, the Wake Cup features live music on some evenings. A quick glance at their dinner menu had me planning a trip back for dinner. And, I’ll be back for more pie! Welcome Wake Cup Coffee House & Restaurant to Central Montana’s Pie a la Road.